“Come hither young peasant and kneel to Enzinga!” Haha sorry… we slipped a pair of the bad boys on and we were stricken with the urge to point at people and rule the world! Whether you want to have some fun bossing people around or you simply want to ramp up the spook-factor on your costume, these gloves fit the bill – and the hand. Nothing says creepy like long slender fingers! You'll look like a mix between a wicked witch and Freddy Krueger when you don these Long Fingered Gloves. The wet look of the gloves and the spindly fingers will turn your whole arm into a nightmarish limb. 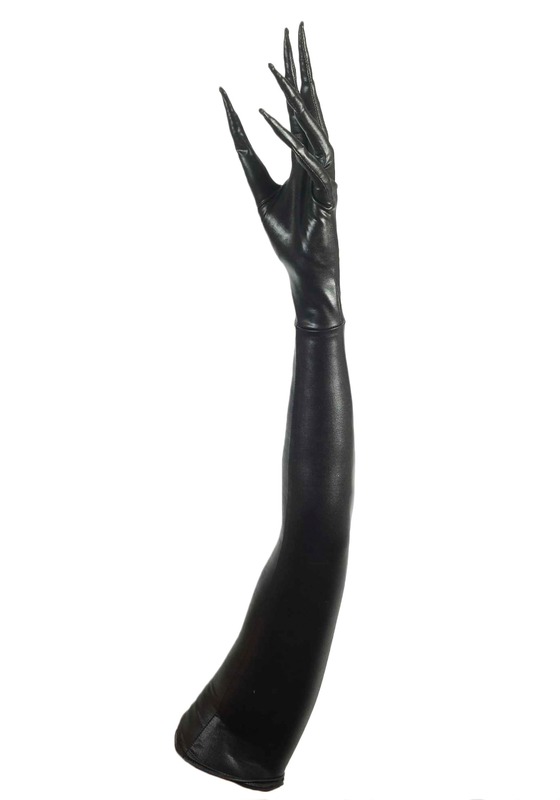 Wear these gloves for an eerie, vampyress or seductress look that can't help but be noticed! Finger tips are barely stuffed, leaving them to fall limp. You have to make adjustments to them for best results. Fabric for the gloves looks really tacky and cheap and the full arm cut of them is not a joke. If you don't have long arms, you'll end up with bunching fabric. All in all, if you can sew, make your own, these are not worth it.